Why is There Always Phlegm in My Throat? Well, we’ll start with the easy question first. I personally think that chilled water is just fine. There are some people that say drinking hot or cold water shocks the cords upon impact, which makes sense, but I don’t think the effects of that would last for more than a second, so I’m cool with it. If you’re worried about it, now that you know why chilled water might be an issue, try it out and see if it bothers you. I doubt it will. When it comes to the phlegm, it’s really too difficult for me to say. It could be allergies, it could be a long standing cold. Regardless, phlegm signals a less than healthy voice. This being said, one of the things that you’ll want to avoid is any type of consistent, aggressive coughing or clearing of the throat as these things can over work the cords and lead to undesired effects. Gargling water is an equally effective way to clear out this phlegm. You could also try gargling salt water, or in more extreme cases, a mixture all natural apple cider vinegar and honey (do not swallow this, as it will likely make you throw up… I know from personal experience). Doing this can help to get rid of some phlegm. All of that being said, if you over sing either in the mid or high part of your range, you’ll likely see your issue return. In this case, you need a little bit more guidance on how to effectively use your voice. 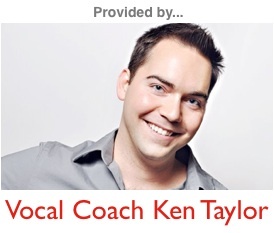 For this, I would recommend finding a good vocal coach to assist you. If this isn’t in your budget, you can start off by reading my How to Sing High Notes article, as it provides a pretty good explanation of how to best use your voice.